Earlier this year we set off on a project with Sovereign Insurance and Youthline Manukau. The idea was to augment the existing community partnership between the two organisations, while synchronously improving the wellbeing of young people through support services offered to them. For Youthline, it was about utilising the Sovereign team’s demonstrable business acumen for the purpose of co-creating systems and processes to increase volunteer recruitment and retention. The Sovereign team picked up new skills in the areas of design and social entrepreneurship, which were readily applied in the Lifehack facilitated events. Participating in a process, as opposed to hosting or facilitating themselves was a relief for people, like the Youthline team whose job is it to create participatory spaces. It allowed full participation, with coordination largely left to Lifehack. Translators between the worlds is helpful in diverse groups. We at Lifehack are often the translators between the world of community and enterprise. As an example, user interviews is a term often used by people in the startup world—which community folks don’t necessarily identify with. However, someone like a counsellor will often apply the principles of a user interview without knowing the term. Reflective questions often used to help describe situations are the same in business and community: “Tell me what was hard about xyz” or “how did that make you feel” are questions used at both ends. We found it important to meaningfully relate terms to the different worlds and demonstrate their relevance to the respective groups. The importance of taking time to built trust and relationships. In particular when our world views, cultural backgrounds or roles in society are different, it’s even more important to take time for whānaungatanga. If you’d like to find out more about what we did, here’s a handy report as well as a video that summarises the main event. Six months down the track we checked back in with both organisations to ask some questions about how it’s been since. Making a splash and having a good time during an event is always fun—but the proof is in the ripple, or the day-to-day changes in the longer term. Youthline Manukau had four active volunteers back in March. They now have 26 – that’s eleven solo counsellors and 15 trainees (people who are on the path to becoming solo counsellors). 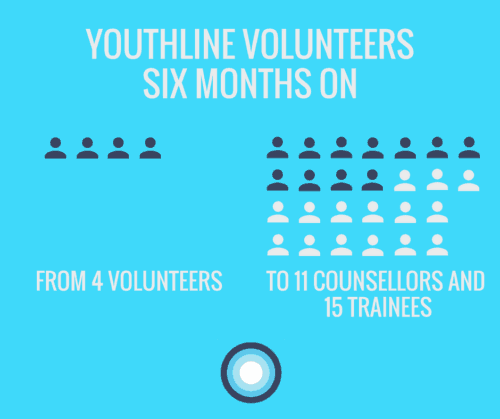 According to the Youthline team, the local centre also took over their own volunteer orientation, with tremendous feedback. On the Sovereign side, we saw some great uptake in entrepreneurial and community tools. Two thirds of participants said that they’d since embedded prototyping and user interviews into work and/or life. 100% have taken on the importance of collaborating in approaching pieces of work, and 83% stated that they acknowledged the importance of building trust and whanaungatanga when working in groups. Describing the changes participant staff noticed in their fellow workers, one of them described that they ‘have really stood up and become noticeable and leaders in their current roles.’ Ka pai! On top of that, all of them described an increased social connection between the people who participant from Sovereign, with one person stating that ‘they’ve become my confidantes and help me work through challenges I’m facing. Best of all: 100% of participating staff said they are now more inclined to volunteer, if they aren’t doing so already. And as we know, volunteering, or giving (time, energy, skills) , is part of the Five Ways to Wellbeing—bonus!